The 81st St. Mary’s Ball raises $1,100,825 to build a new modernized home for our palliative and cancer care patients on the hospital’s 5th floor. The St. Mary’s Community joined together in the opulent surroundings of Windsor Station’s Salle des Pas Perdus in a true celebration of leadership and pride at the longest running healthcare ball in this city. 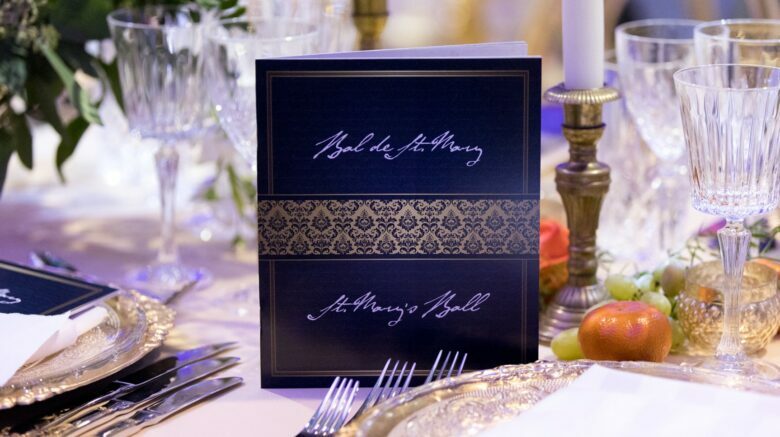 As many as 700 elegant guests found themselves immersed in the lavish beauty of the Renaissance Era – swooping velvet curtains, timeless masterpiece paintings in gilded frames, tables dressed with colorful roses and golden candelabras while images of great innovations graced the scene. The President of the evening, Alain Bellemare along with Marie-Josée Simard, were on hand to greet guests at a champagne cocktail before everyone whisked into the ballroom to find their seats. Emcee duties were handled expertly by Arthur Wechsler, Chairman of the Ball Committee and Member of the St. Mary’s Hospital Foundation Board of Directors, who shared his own personal patient-experience at St. Mary’s before inviting Alain Bellemare to address the audience. There was a special blessing performed by Tenor, Davide Bazzali accompanied by Pianist and Baritone Manuel Blais. The dinner menu was skilfully prepared by one of Montreal’s culinary best – Chef Adele Forgione from Restaurant Beatrice and included a tantalizing salad frisée with a grilled pear starter, followed by an outstanding rabbit ragu. The main course was a show stopping herb crusted rack of lamb topped off by a dessert of sinful deconstructed cannoli cake. The meal was paired with specialty wines selected and offered by the SAQ. Throughout the evening guests enthusiastically participated in the raffle and silent auction while 1945 Animation Paul Chacra Entertainment kept the dance floor pumped and hoping until the very end. There was a special performance showcasing a “Vitruvian Man” by an astounding acrobat from Manina World. A highlight of the night included a special video created by Eclipse Productions showcasing St. Mary’s Medical Chiefs and “The Masters of Care” as they set the standards for healthcare throughout the province. Proceeds from the evening will benefit the complete renovation St. Mary’s 5th to build a modernized home for our palliative and cancer care patients that will deliver today and provide for their needs tomorrow. We are honoured to thank our community – participants, sponsors, volunteers and patrons – for their generosity and dedication in making this year’s event a resounding success.